The DICKEY-john Soil Compaction Tester is a simple, easy to use management tool that can help you increase yields and decrease costs. The Soil Compaction tester can give you quick answers to the questions you need to ask about your tillage program and your field conditions. Is your soil compacted? How severe and how deep is the compaction layer? How deep do you need to till? How deep can your roots grow? Is soil compaction costing you? Get moisture readings on the go with the M3G™ portable moisture tester. The mini GAC, which measures moisture content very accurately, is based on the standards of DICKEY-john’s GAC2100b, the U.S. federal standard for grain trading. Benefits of the mini GACs include a menu-driven operating system, an internal scale eliminating the need to pre-weigh grain, calibrations for more than 450 varieties of grain and products, and automatic temperature compensation. The battery-powered units weigh less than 2.5 pounds and can receive new calibrations with the ease of a USB connection. The mini GAC will measure grain moisture between 5% and 45%. It measures grain temperature ranging from 32 to 122° F automatically, without any further preparation of the grain sample. The mini GAC plus, which measures moisture content very accurately and test weight, is based on the standards of DICKEY-john’s GAC2100b, the U.S. federal standard for grain trading. Benefits of the mini GACs include a menu-driven operating system, an internal scale eliminating the need to pre-weigh grain, calibrations for more than 450 varieties of grain and products, and automatic temperature compensation. The battery-powered units weigh less than 2.5 pounds and can receive new calibrations with the ease of a USB connection. The mini GAC will measure grain moisture between 5% and 45%. It measures grain temperature ranging from 32 to 122° F automatically, without any further preparation of the grain sample. The mini GAC Plus is shipped in an attractive and durable carrying case. This compact, cost-effective unit lets you analyze grain moisture, temperature, and test weight anywhere on the farm. For fast, accurate moisture testing, you can’t beat the GAC®500 XT:Just choose a grain, load the hopper, and press a button. When it comes to top-of-the-line grain testing at an economical price, look no further than the GAC® 2100 Agri. The GAC® 2100 Agri provides grain testing results in just 32 seconds and has the ability to store eight grain calibrations. DICKEY-john's GAC2100b means increased reliablility of moisture readings through fully automatic operation. Just pour the sample into the hopper, select grain type, and press the LOAD button. It's that simple! Self-test before each moisture reading. 64-calibration memory, with user-defined "quick-keys" for automatic selection of most used grains. Automatic calibration selection through the whole moisture range. Automatic creation of sample indentification number, test date & time for improved record deeping. Error messages warn the operator if any measured value is outside allowable limits of calibration. Automatic loading and strike-off leveling ensure consistent sample size. Automatic sample weighting compensates for variations in test weight, which effects moisture readings, thereby eliminating the need for manual pre-weighing. 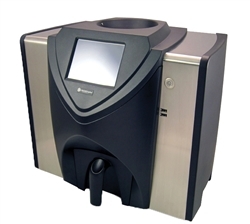 Automatic temperature correction measures and compensates for variations in grain sample temperature. The New Federal Standard in Grain Moisture Analysis GAC2500-UGMA The DICKEY-john Grain Analysis Computer (GAC) 2500-UGMA is the next generation of moisture testers from the world-wide leader in grain moisture analyzers.